Thank you for including the animals at Carolina Tiger Rescue in your portfolio! Please see transfer instructions below. Our legal name is Carolina Tiger Rescue. Our Tax ID# is 56-1522499. 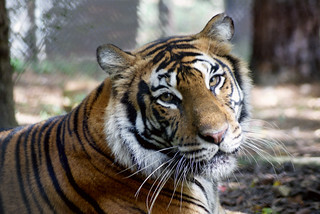 NB: Prior to 2019, our legal name was Carnivore Preservation, Inc. dba Carolina Tiger Rescue. If you hold securities with a broker or a bank, you may transfer them electronically by instructing your broker to send the securities to our account through the Depository Trust Company (DTC). Please contact Carolina Tiger Rescue to let us know that you will be making a gift of securities. We will need your name, the name of the security, and the number of shares being donated, in order to properly acknowledge your gift. If your mutual funds are held by the fund company, please contact Heidi Zangara, Planned Giving Manager, for more information. Note: Most mutual fund companies have a toll-free number for shareholder questions. You may want to call them to confirm the proper procedure for making a gift of your mutual fund shares. If you would like more information on gifts of stocks, bonds, or mutual funds, please contact Heidi Zangara at Carolina Tiger Rescue by calling (919) 542-4684 x 3010 or emailing Heidi Zangara.